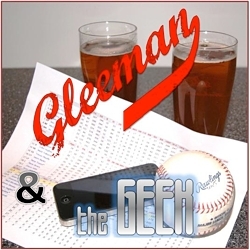 • Sunday on Gleeman and The Geek we talked about Jason Marquis' latest clunker of a start and how much longer the Twins could possibly stick with him in the rotation. 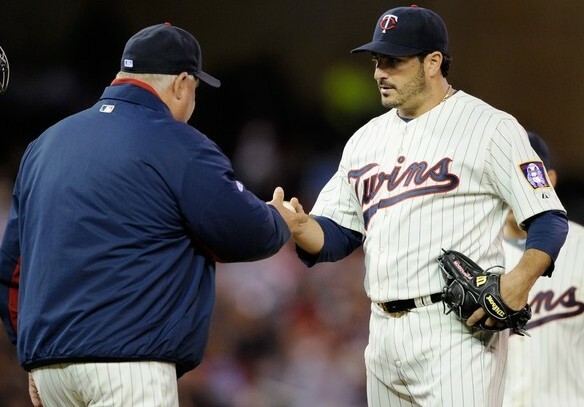 It didn't take long for an answer, as the Twins designated Marquis for assignment seven starts into a $3 million deal given to the 33-year-old veteran who was supposed to help stabilize a shaky rotation. Minnesota native and former Gophers star Cole De Vries was called up to take his spot. Marquis now goes in the same pile as Ramon Ortiz, Livan Hernandez, and Sidney Ponson, each of whom were signed more for their veteran-ness than ability and got booted from the rotation after performing terribly. Those four pitchers combined to cost the Twins around $12 million for 303 innings of a 5.88 ERA and in each case the terrible performances were entirely predictable, although certainly Marquis was even worse than anyone could have expected. He posted an 8.47 ERA and allowed 33 runs in 34 innings with more walks than strikeouts and nine homers, as opponents hit .371/.434/.629. To put that in some context, consider Albert Pujols is a career .325/.417/.609 hitter, so Marquis basically turned every batter he faced into a souped-up version of this era's best hitter. He wasn't throwing strikes, he wasn't keeping the ball in the ballpark, and he ranked dead last among MLB pitchers in swinging strikes. When the Twins signed Marquis this winter I called it "an uninspired pickup made necessary by payroll slashing" and noted how odd it was for Terry Ryan to praise his ability to "throw the ball over the plate" when in reality his career walk rate was identical to Francisco Liriano's at 3.5 per nine innings. Marquis' awful control shouldn't have been a surprise, but all the homers from a ground-ball pitcher were unexpected and turned a questionable signing into a disaster. • Unfortunately the Chris Parmelee situation played out exactly as I'd feared when the Twins chose to focus on an impressive September call-up and strong spring training while dismissing a mediocre track record. They had Parmelee skip Triple-A despite hitting just .282/.355/.421 in two seasons at Double-A and then relegated him to the bench when he predictably struggled in the majors, demoting him to Rochester when Justin Morneau came off the disabled list. Parmelee was and still is a decent prospect with some long-term upside, but at no point has he ever looked like a potential star and it's silly to expect a 24-year-old to go directly from slugging .421 at Double-A to thriving in the majors. Hopefully the less than ideal development decisions won't keep him from getting back on track in Rochester and hopefully the Twins will cease taking such short-term views of their prospects. For one scout, "the list begins and ends with Sano." Signed out of the Dominican Republic for $3.15 million in 2009, Sano hit 20 home runs in 66 games in the rookie-level Appalachian League last year. As one of the youngest players in the Midwest League this year--the toughest offensive circuit among full-season leagues--expectations, at least statistically, were tempered. Apparently nobody told Sano, though, as he leads the Midwest League in home runs (11) and total bases (85) while hitting .287/.406/.625 in 38 games. He just turned 19 last weekend, and for players this young, power is usually overwhelmingly on the projection side of the ledger. We haven't see this kind of in-game power from a player so young in low Class A since Giancarlo Stanton was known as Mike. Giancarlo Stanton hit .293/.381/.611 with 39 homers in 125 games at low Single-A in 2008 as an 18-year-old and was in the majors five months shy of his 21st birthday, quickly emerging as one of the league's top sluggers. He's now 22 years old with 290 career games for the Marlins and has hit .263/.344/.523 with 65 homers, trailing only Pujols, Manny Ramirez, and Alex Rodriguez in Isolated Power among all active right-handed hitters. • Nick Blackburn is back on the disabled list, although this time at least it's not an arm injury. Since signing a four-year contract extension in March of 2010 he's thrown 343 innings with a 5.31 ERA and .306 opponents' batting average. During that time Blackburn's strikeout rate of 4.3 per nine innings is MLB's worst among all pitchers with 250-plus innings. He's making $4.75 million this season and under contract for $5.5 million next year. • P.J. Walters has gone from Triple-A depth to spot starter to being secure in the big leagues based on two decent starts and the Twins reaching the bottom of an already shallow barrel for rotation reinforcements. He's allowed four homers through 12 innings with the Twins, which gives Walters a total of 16 homers allowed in 63 career innings as a big leaguer and ranks as the sixth-highest home run rate in MLB history among all pitchers with 60-plus innings. • One-time top prospect turned minor-league veteran Joe Thurston signed with the Twins for Triple-A depth in late April, but went 4-for-43 (.093) in 15 games and was released last week. They also cut Triple-A first baseman Aaron Bates, who re-signed with the Twins after hitting .316/.408/.439 in 106 games for Rochester last season only to hit .238 in 28 games this year. After back-to-back 90-loss seasons got their manager fired Rochester is on a 62-82 pace. • Wilson Ramos, whom the Twins misguidedly traded to the Nationals for Matt Capps in July of 2010, will miss the remainder of the season with a torn ACL in his right knee. That lessens the chances of Ramos' departure haunting the Twins, but it doesn't actually make the trade less bad any more than, say, selling your house for $100,000 below the market rate only to see the new owners accidentally burn it down makes that decision less bad. • Lew Ford, who last played in the majors for the Twins in 2007 and is now 35 years old, signed a minor-league contract with the Orioles and took over as the leadoff hitter and center fielder on their Triple-A team. Since being dropped from the 40-man roster by the Twins in late 2007 he's played for multiple organizations at Triple-A along with the independent league Long Island Ducks and teams in Mexico and Japan. • Steve Tolleson never reached the majors with the Twins, getting dropped from the 40-man roster in February of 2010, but he had a brief cup of coffee with the A's that year and the 2005 fifth-round pick is now back in the big leagues with the Orioles. Tolleson was no more than a marginal prospect, cracking my annual top-40 list just once at No. 37 in 2010, but he always looked capable of being a useful utility man. • San Diego's ex-Twins middle infield is no more, as the Padres released Orlando Hudson with about $5.5 million remaining on his contract and placed Jason Bartlett on the disabled list. Hudson quickly latched on with the White Sox, who're his fifth team in five seasons, and he's apparently going to play third base for the first time in his career. • Old friend J.C. Romero may finally be finished at age 36. He debuted for the Twins in 1999. • In blanking the Twins last week Indians right-hander Derek Lowe became the first pitcher to throw a complete-game shutout without a strikeout since Scott Erickson in 2002. • Sano, Eddie Rosario, and Oswaldo Arcia are the only hitters in the Twins' entire farm system with an OPS above .800, and none of them are above Single-A or older than 21. • Ben Revere had just one total extra-base hit in 23 games at Triple-A, so naturally he has four extra-base hits in four games back with the Twins. Play right field, hit for power. Easy! 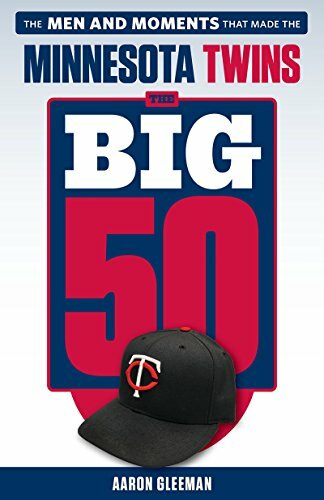 • Not only is he hitting .360 in nine games since being recalled from the minors, Drew Butera became the sixth position player in Twins history to pitch when he mopped up in Sunday's blowout loss. Better yet, Butera averaged 91.1 miles per hour with his fastball, topped out at 94.4 mph, and struck out Carlos Gomez in a scoreless inning. Butera's average fastball clocks in higher than Marquis, Blackburn, Walters, Carl Pavano, Scott Diamond, and Liam Hendriks.